"Darwin has been proven wrong by recent research"
The Genius in All of Us: Why Everything You've Been Told about Genetics, Talent and IQ is Wrong, by David Shenk, is published by Doubleday. What Darwin Got Wrong by Jerry Fodor and Massimo Piattelli-Palmarini is published by Profile. Now, genetics isn't my specialty so I don't read the scientific journals in the field. But I am "in touch" enough to know the difference between real genetics journals and popular outlets like New Scientist. To do this guy credit, he didn't cite some of the real junk out there, like Answers in Genesis or TalkOrigins. These are at least semi-reputable. But this is akin to the guy who reads "I am Joe's Hangnail" in the Reader's Digest and thinks he's qualified to go toe to toe with a doctor. He's talking about research that indicates that traits may be influenced by more than simple inheritance. Chickens placed in a stressful environment had offspring that behaved differently under stress than non-stressed chickens. Apparently stress triggered a change in the way genes are expressed and that response was passed along. Viruses play a role in modifying genes, especially in micro-organisms, and it's known that microorganisms can "catch" drug resistance from other species. So how does this make Darwin "wrong?" Genes weren't even known in Darwin's day, so how can any discoveries in genetics make him "wrong?" Here's Darwinian evolution in capsule form. Organisms with beneficial traits have a greater likelihood of surviving and mating compared to those with disadvantageous traits. More organisms are born than can possibly survive. Well, you can do the math with say, flies. If one pair of flies lays 100 eggs and they grow to maturity in a couple of weeks and mate and lay more eggs, the numbers within a couple of months get absurd. Or go to your local animal shelter and get a lecture on spaying and neutering. Individual organisms show variations. Look at a litter of kittens or puppies if you have any doubts. And we're not saying anything about how the variations arose. So they occur by a virus inserting new DNA. So what? They're still variations. Some variations are more beneficial than others. We have two small dogs, one about 50% bigger than the other. They're litter mates. The small one was the runt. She also has a heart murmur and a narrowed trachea. Those are not beneficial variations. Organisms with beneficial traits have a greater likelihood of surviving and mating compared to those with disadvantageous traits. Our little runt dog would definitely be at a disadvantage in the wild. Even in a protected setting, she may not live as long as her sister. Both, since we're responsible pet owners, have a zero per cent chance of mating. These are all common sense observations. Nothing in genetics has the slightest effect on their validity. "Quantum Mechanics and Relativity have disproved Newton"
Newton didn't anticipate that odd things happen close to the speed of light. So if you apply Newton's formulas to things moving at close to the speed of light, you'll be wrong. How wrong? The formula for the energy of something in relativity is E = mc2/sqrt(1- v2/c2). So as v approaches c, the square root term gets closer to zero and energy gets closer to infinity. This is one of the reasons you can't travel at the speed of light? But what happens if v is, say, 100 km/hour? Everyday speeds. What happens then? Well, you can also write that 1/sqrt(1- v2/c2) part as a series of terms. You get (1 - (1/2)v2/c2 + (3/8)v4/c4 + .....). If v is 300 km/sec, way faster than any macroscopic object we have ever launched, then v/c = .001, and v2/c2 is .000001 and v4/c4 is .000000000001. This is a common tactic in mathematics and especially calculus. If higher terms are extremely tiny, we can just ignore them. So we have E = mc2(1 - (1/2)v2/c2) and E = mc2 + (1/2)mv2. That E = mc2 part is the formula for converting mass to energy. This is the part that Newton didn't know about, but since we never see it in everyday life, it doesn't matter. The only time you ever see it is when you flip on a light switch and your power comes from the local nuclear plant, or when you bask in the sun or look at the stars. If you ever see it any other way, you are going to have an extremely bad day. The other part, (1/2)mv2, is just the Newtonian formula for kinetic energy. So, far from disproving Newton, relativity gives the same results. Okay, what about quantum mechanics? Newtonian physics doesn't apply at the atomic scale, which Newton didn't know because he was quite a bit bigger than an atom. He also moved a lot slower than light, which is why he didn't know about relativity. In fact, it was trying to come up with a Newtonian picture of atoms, and failing, that led physicists to quantum mechanics at all. The first clue was that electrons can orbit the atom at all. Normally, if you force electrons to travel a curving path, they'll emit radiation and lose energy. Electrons should quickly spiral into the nucleus. Physicists were forced to assume that, for some reason, electrons didn't obey that law. Then it turned out that the electron energies could only have certain values. They were "quantized." Physics was a victim of its own success, because modeling a hydrogen atom as a tiny solar system was so successful it created an image that still misleads everyone. But attempts to build more elaborate models with more complex atoms simply failed. At least the weird nomenclature of quarks, with flavor, color and charm, don't carry too much risk of people assuming quarks really taste like chocolate, are blue, or flirt. Most of the weirdness in quantum mechanics involves the fact that matter isn't anything familiar. Are electrons waves, or particles? Yes. There are times, like an old-time TV tube, where it makes sense to treat them as particles. There are other times, like electron microscopes, where it makes sense to treat them as waves. The reality is that they're something for which we have no analogs at our scale of existence. That means we can't apply particle-like definitions. We can't define both the position and momentum of a particle beyond a certain precision. Joke: a cop stops a physicist. "Do you know how fast you were going?" "No, but I know exactly where I am." We use analogies that create the impression that it's just our clumsiness that interferes, that when we measure position, we disturb the momentum of the particle. The reality is that matter is just inherently fuzzy at very tiny scales. The worst misapplications of quantum mechanics come from the fact that often, the results of an experiment depend on how we set it up. If we set up an experiment that treats electrons as particles, we see particle behavior. If we set it up as if electrons are waves, we see wave behavior. This has led a lot of would-be mystics into a kind of quantum solipsism, where we determine reality by our expectations. There's only one problem with that. If our expectations determined the outcome of experiments we would never have discovered quantum mechanics at all. In fact, we'd probably be using the physics of Aristotle because we'd never have discovered anything that unexpectedly contradicted him. What effect does quantum mechanics have on a baseball? The uncertainties in position and momentum are subatomic. The wavelength associated with something as massive as a baseball is beyond subatomic. In fact, there's a fundamental principle in quantum mechanics called the correspondence principle. When dealing with very large systems where Newtonian physics works, quantum mechanics must yield the same results. Not only does quantum mechanics not disprove Newton, it has to agree with him. "Plate Tectonics shows that Wegener was Wrong"
In the case of Darwin and modern genetics, or Newton and modern physics, we have scientific ideas that were very rudimentary when first proposed and which were greatly elaborated by later discoveries. No doubt they both had some wrong ideas, but those were quickly corrected and are of historical interest only. Alfred Wegener's theory of continental drift had some important elements that were factually wrong and which his opponents used to attack his theory. The very name "continental drift" implies there's something special about the continents. I mean, we live on them so they must be important, right? He pictured the continents being driven by a force away from the poles, and as plowing through the earth's interior like ships in the sea. In fact he pictured mountains like the Andes as being a sort of "bow wave." And those were just wrong. Even worse, they were demonstrably wrong even by the standards of the time. Seismology was already advanced enough to give us a good idea of the mechanical properties of the earth's interior and it turns out that the earth's mantle is far too strong to allow continents to push through it. There was an American geologist, Frank Taylor, who also proposed something very much like continental drift at about the same time. And some of his interpretations actually look more modern than Wegener's. For example, here's how he pictured Greenland breaking away from North America. The only words to describe this are "dead on target." Apart from calling Davis Strait a "rift valley" and Greenland a "horst" (upraised block), this is pretty much exactly how modern geologists interpret this region. I have a copy of Taylor's paper, and I weep with frustration to think of it. He got almost 50 pages to explain his idea, whereas a modern geologist would be lucky to get half a dozen. And most likely the paper would be rejected as too "speculative." Taylor actually predated Wegener by a couple of years, and thought that Wegener had stolen some of his credit. Having compared both versions, I don't think so, and it strikes me as a bit like fighting over who gets to be captain of the back half of the Titanic, considering how much opposition the theory encountered. But there's no doubt about Taylor's insight. So why does Wegener get more of the credit? He assembled more kinds of evidence, including the famous ice age and Gondwanaland fossil evidence, and presented a more global picture. Despite the problems with Wegener's mechanisms, the picture was compelling enough to keep a small minority of geologists fine-tuning the idea and keeping it alive. Finally after World War II, technology for sensing the ocean floor, much of it originally developed for anti-submarine warfare, became available. It turns out the continents do move, but only because the entire crust is moving. The crust is made of a dozen or so large slabs, called plates. All the active processes occur in the ocean basins. So Wegener had the big picture correct, but many of the smaller details wrong. 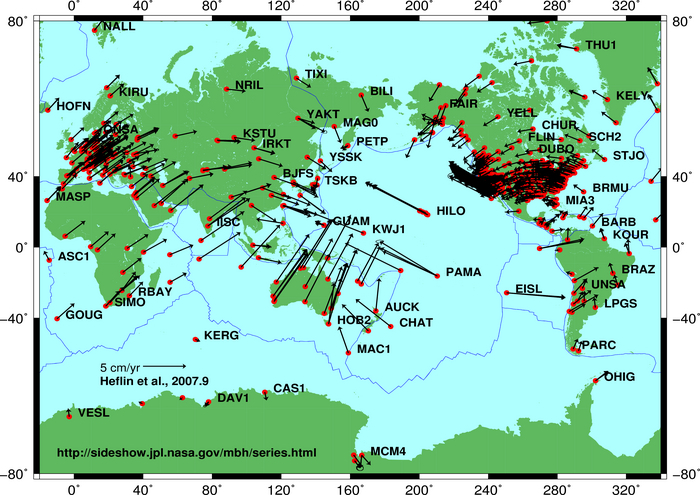 Nowadays, thanks to GPS, we can actually see plate tectonics happening in real time.